'An Unexplained Death' Tells The Tale Of An Unsolved Mystery — And Being Remembered Mikita Brottman takes readers through a years-long journey of obsessive curiosity, trying to get to the truth of what happened after a body is discovered her apartment complex, formerly an old hotel. The last time anyone reported seeing Rey Rivera alive was Tuesday, May 16, 2006. A few days after that, writer and professor Mikita Brottman saw a "Missing" poster in her Baltimore neighborhood, including Rivera's photo, descriptions of his clothing, age, height and weight — and the promise of a $1,000 reward for any information leading to his return. On May 24, Rivera's body was discovered in an empty, abandoned room in the second-story annex of the Belvedere, once a grand hotel that has for years now been largely made up of condos — one of which Brottman lives in with her partner and dog. Having plunged through the roof of this room, Rivera's body had been lying there for some time. While many assumed Rivera had jumped, others believed — with fervid certainty — that he'd been pushed or thrown. He was happily married and planning to move back to LA with his wife to pursue screenwriting. He had booked office space for the weekend after his disappearance, planning on editing the footage of a corporate event he'd been hired to film. With no history of mental illness, no sudden shock that anyone knew about, it seemed impossible that Rivera had died by suicide — but it seemed equally impossible that anything else could have happened: Forensic analysis and physics indicated he not only fell but took a running leap from the roof in order to reach his landing place. 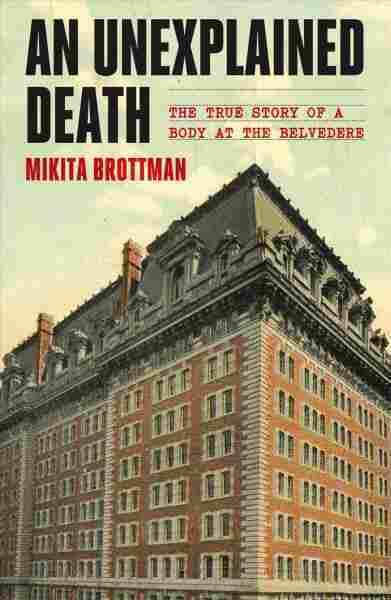 During the next 10 years, Brottman remained interested Rivera's mysterious death. Her new book, her tenth, An Unexplained Death: The True Story of a Body at the Belvedere, takes readers through a journey of these obsessive years of curiosity, of trying to get to the truth of what happened. At least, that's what book is doing on the surface. It does, indeed, delve into the details of Rivera's disappearance and subsequent death. Brottman meticulously follows any and all threads she can, including a long and fascinating detour into the world of Agora, a somewhat sinister and extremely wealthy company Rivera worked for shortly before his death. Many — including both conspiracy theory forum members and Rivera's widow — believed it had something to do with this death. But Brottman's book is, sneakily, more than just a true crime narrative. It is also a history of the Belvedere and its long association with death. Sprinkled through the narrative are anecdotes of violent murders, suicides, and natural deaths that occurred, and still occur, in the building's rooms, out its windows, and off its roofs. These colorful stories often seem to have little to do with Rivera's death, and yet Brottman's confidence in dropping them in, seemingly at random, belies that they are not random at all. For instance, after sharing how Rivera was described in the initial police report as "a decomposed body of a male," Brottman seamlessly transitions into a brief history of dissection, explaining that the Office of the Chief Medical Examiner, which sits on the campus of University of Maryland School of Medicine, first opened in 1807 and was "immediately closed again for almost seven years because of riots protesting the dissection of human corpses, many of which, rumor had it, were stolen from St. Paul's churchyard adjoining the medical school... [H]uman dissection was not permitted in Maryland until 1882." This bit of history both sheds light on the language we use about humans after their death and the changing nature and acceptance of science that has brought us to the present day, where — if crime shows and true crime documentaries are any indication — we put much stake, indeed, in the cold science of an autopsy. Perhaps most of all, though, An Unexplained Death is a veiled portrait of the author herself. Brottamn mentions early in the book that starting in college, she'd begun to feel invisible and sought a psychoanalyst's council on the matter — he didn't seem to help much. Layered throughout the book are indications of this affliction, how her own neighbors seem to forget her face in between introductions, how friends appear to forget about her when she's not around. The extremely human anxiety Brottman seems to be grappling with is one many of us may consider at one time or another: If we went missing, would anyone look for us? Rey Rivera, she believes, was a good man, a loving husband, smart and hardworking. But, mostly, he was noticeable — and even long after death, he remains so.